Our Silk Black Carbon soft dome tweeters provide sound with a startling smoothness, clarity and a seamless transition to midrange frequencies. They are designed to take wattage and deliver ultimate sound quality thanks to the internal ferrofluid cooling design. The ferrofluid inside help to keep the tweeter cool and operating smoothly without any distortion or interruption in sound. Our Kevlar drivers provide a durable, ultra-light yet very rigid cone to produce clear bass, crisp midrange while the fibers help to absorb any standing waves remaining in the cone. Due to its extreme toughness, strength, durability and lightness, kevlar is used in bullet proof vests. 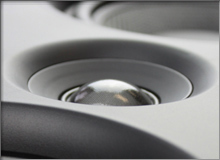 It lends its strengths seamlessly to provide the best sound from our speakers. 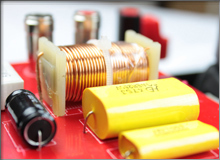 Discrete components provide clear, non-distorted sound that typical IC (integrated circuits) can’t provide due in part to their ability to be less susceptible to electrical interference and noise. Integrated circuits, by definition, require large amounts of negative feedback in order to operate, while a discrete component design can be done with little to no negative feedback. Having separate components complete its own job for the speaker will provide the best, distortion-free audio. Each speaker uses multiple neodymium magnets to securely hold the grill to the speaker while allowing them to be removed without any tools. Using magnets to hold the grills in place allows us to provide a slimmer grill with a better appearance and allows the speakers to be installed extremely easily. Our ultra-thin bezel enables the speaker to offer a minimal aesthetic impact in your homes décor while providing a modern design. The thin bezel will also give the ability the squeeze the largest speaker possible into your home, giving you the best possible sound. Our high tension, low resistance, spring loaded binding posts provide a secure connection for bare wire while keeping the resistance as low as possible to give you the clear non-distorted sound you demand. Using such strong and high tensioned binding posts will grip and hold your speaker wire securely, helping ensure that you will have trouble-free performance for the life of your audio system. 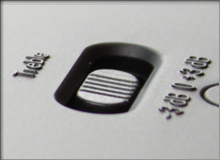 Our Boundary compensation control switch allows you to fine tune the speakers performance after installation. 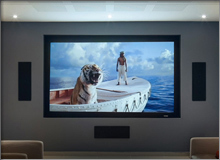 Due to the design of homes often in-wall speakers can’t be placed in an absolutely ideal location. Whether this mean to close too a side wall, the ceiling or the floor. 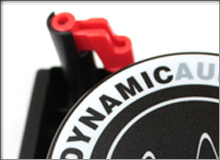 The boundary compensation switches allow you to fine tune your speakers for optimal performance, for any room. 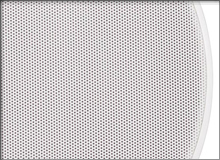 Our in-ceiling speakers come standard with both round and square grill options in each box. You can quickly swap grills in your room, and stick with the preferred choice, never having to second guess whether you should have chosen a different style. 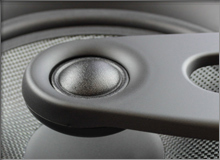 Using a discrete floating tweeter instead of a typical coaxial design allows the tweeter to have an ideal backing for correctly tuned high frequencies. This also allows the midrange driver to perform undisturbed to give you deeper bass, higher db level and more accurate response. 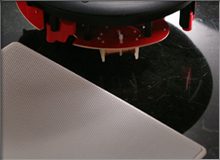 To allow the speakers to fit seamlessly with any room décor, the user can paint the grills any colour. No longer do you have to choose between speakers that fit your colour scheme and those that perform to the highest user expectations. Butyl rubber surrounds will not dry rot like typical foam surrounds. 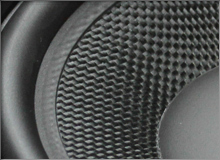 Using rubber instead of foam will allow the speaker to give you accurate detailed music for the life of the speaker. 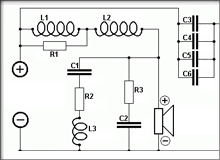 The crossover is the first point of passage for a signal coming into a speaker. The crossover is as important as tweeter, woofer and cabinet design. 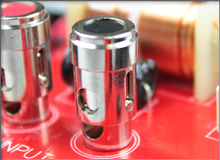 Our passive crossovers use high quality capacitors, inductors and resistors to take in the account for the speakers abilities a divide them up properly to allow each component to excel properly and give you the accurate precise audio you expect. 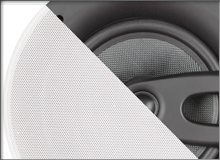 The dog-ears offer a quick and simple installation that provide a resonance free install. Simply slide the speaker into the wall and turn each of the dog ear brackets until they securely clamp the speaker to the drywall. Using dog ears is one of the easiest, quickest and most secure ways to install an in-wall speaker. 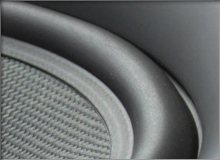 Its simplistic and secure design is used for all of our speakers.